Blink-182 have confirmed a second show with Alkaline Trio’s Matt Skiba in place of Tom DeLonge. 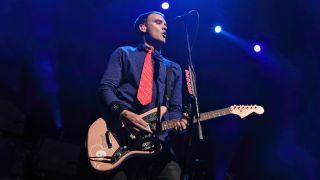 Skiba had been named as temporary frontman for the band’s appearance at the Musink Festival in California on March 22, after relationships broke down between DeLonge and former colleagues Mark Hoppus and Travis Barker. Now the duo have confirmed they’ll play with Skiba on March 20 at Soma in San Diego. The situation remains strained after the remaining original members announced their “indefinite” split from DeLonge in January – but he insisted he hadn’t left.